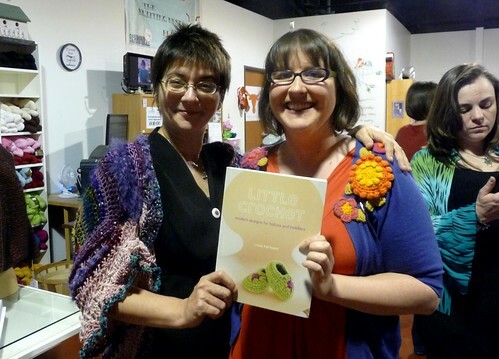 I just met Laurie Wheeler this weekend, when she was in town (er, close enough) for the Crochet Liberation Front Flamies Live ceremony (which you can listen to here). Laurie, aka Fearless Leader, has been writing for years about the crochet market and encouraging more high-end yarn companies to cater to crocheters. When I talked with her this weekend, she told me that her 17-year -old daughter ran away with the book, and that we had to take our picture together for her. Hello Laurie’s daughter! Your mom is cool! And while I’m on the subject of her daughter stealing her book, I have to tell you that by now I’ve heard quite a few stories of people trying to run off with my blog tour participants’ books–including moms, daughters, and sisters. So even if you don’t have a little one of your own at the moment there are some ideas inside for you. My friend Debbi is making the Soft Owl Pillow for her college age daughter’s roommate. Margaret wants to make the Everyday Washcloths for herself. Older kids/adults can definitely make use of the Felted Play Rug and some of the blanket patterns with simple modifications. And of course, you can always start being a ‘crazy old lady’ (and I mean that in the best way) early and stashing clothes for future babies. Ahem. Not that I do that. 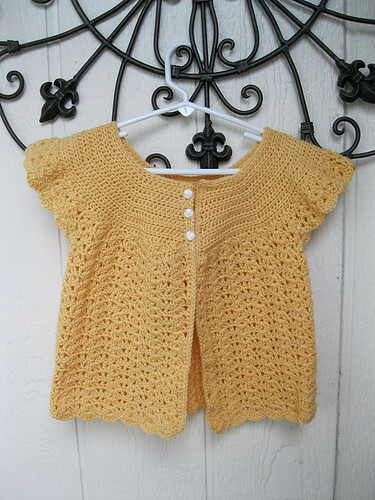 Speaking of stashing, here’s a beautiful Banana Swing Set Cardigan that my friend Theresa worked up over the weekend. Admittedly, she did it in a procrastinatory effort. But, it’s so much prettier than the paper she was supposed to be writing, don’t you think? This new book of yours is tempting to me even though I have no babies (but yes little cousins) As soon as I can make it I'll buy it. CONGRATULATIONS...and please keep hooking and preparing MANY MANY more books....Thanks for your creativity!" Greetings from Spain Linda!